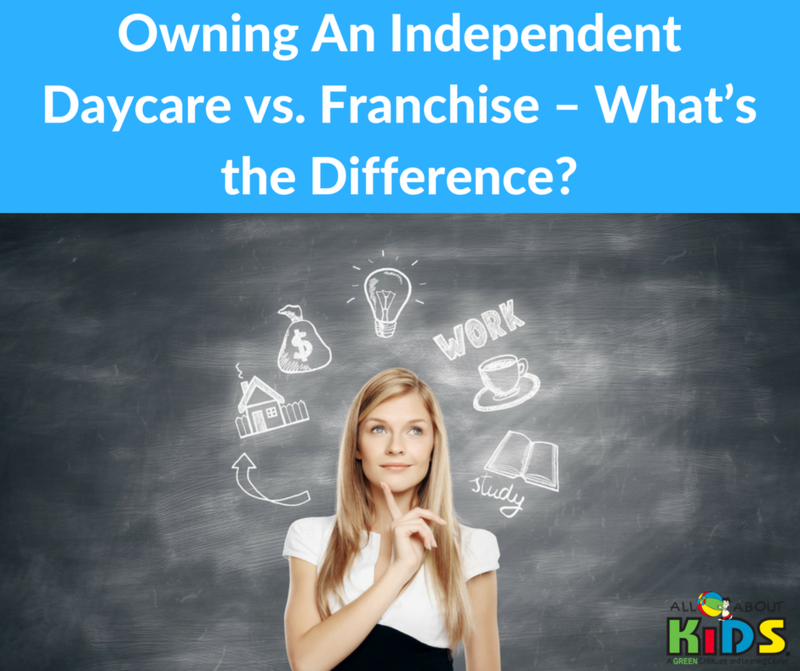 All About Kids Child Care Franchise > Blog > Franchise Blog > Owning An Independent Daycare vs. Franchise – What’s the Difference? The daycare market in the US is a $48 billion industry. 61% of mothers with kids under age three are working or looking for work. And this by no means a passing fad. The U.S. Census Bureau reports 32.7 million children were in steady childcare arrangements. Because demand for this kind of environment is so strong, the number of childcare and daycare facilities has nearly tripled over a 20-year period. While that may sound like the market has gotten saturated, there’s a very important reason that’s not the case. Even though there are a lot of facilities across the United States, only a small percentage are able to provide what parents truly want. Parents are looking for a learning environment that will help their children grow socially, developmentally and academically. This presents a significant opportunity for business models that can provide a learning center dedicated to helping shape and develop children into a generation of responsible, caring people. If you’re interested in this space and the huge opportunity it presents, the two main ways to pursue it are through owning an independent day care or franchise. As you compare these options, it’s important to keep a few things in mind. First, not every franchise opportunity in this space is equal. Second, the most common criticism of the franchise model is the requirement to pay a franchisor. While it’s something you need to carefully evaluate, the fees you pay to the right franchisor can actually save you quite a bit over the long-term. The last thing to keep in mind is the double-edged nature of independent ownership. Although it means you have full autonomy with all your decisions, this freedom also increases the likelihood of making one or more significant mistakes along the way. All About Kids Childcare and Learning Centers are experiencing a larger annual growth rate than other top childcare and daycare franchises. Since our launch in 2008, we’ve been able to create this kind of opportunity for franchisees by offering a new kind of daycare and childcare model. Although we’re proud of the support we provide during every stage to our owners, we offer a lot of freedom as well. Our owners have the ability to set their own hours and hire their own staff. We also make it possible to operate a single center or multiple centers. Best of all, the liquid cash requirements for an All About Kids franchise are significantly lower than other daycare and childcare franchises in the Midwest. If you’re excited about the prospect of getting involved with the only LEED-certified green child care center franchise in the country, you can get started today by requesting more information.